for monitoring persistent cerebral spinal fluid fistulas, cranial protuberance, sub occipital decompression and also in cases of transitory defective cerebral spinal fluid absorption (post meningitis or post hemorrhagic hydrocephalus). 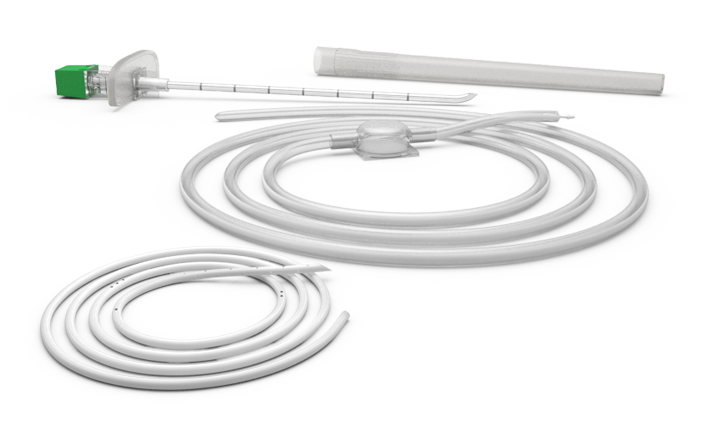 Silicone radiopaque, with outer diameter 1.6mm, with markings every 5 cm to guide the insertion depth. connection protector to prevent unintentional disconnection. Made in radiopaque silicone, with 1.6mm outer diameter, with markings every 5 cm to guide the insertion depth. Connection protector to prevent unintentional disconnection. Tuohy needle 14G stainless steel marking each 1cm for insertion depth control. Wire flexible guide wire to facilitate catheter insertion.